Pictured, from left, are Council Member Kevin Smith II, Council Member Keith Claassen and Clerk-Treasurer Patti Cook. ETNA GREEN — The Etna Green Town Council discussed the potential for development at Winona Powder Coating during its meeting Thursday, March 21. Brian Bailey, Winona Powder Coating president; and Alan Tio, Kosciusko Economic Development Corporation CEO, were present at the meeting to discuss development within Winona Powder Coating. Bailey told the town council that the company is planning to add a third heavy-duty line within the next year and is anticipated to add 20 jobs. Tio and Bailey also discussed the United States Department of Agriculture Rural Development program. The program helps provide funding for rural projects through local utility organizations. The USDA can provide up to $2 million in zero-interest loans that will help create or retain rural jobs in the area. During the conversation, Tio said the town would be responsible for the loan if Winona Powder Coating were to go out of business. The town council voted to table further discussion on the subject for next month in order to receive feedback from town attorney Jay Rigdon. Rigdon was not present at the meeting. 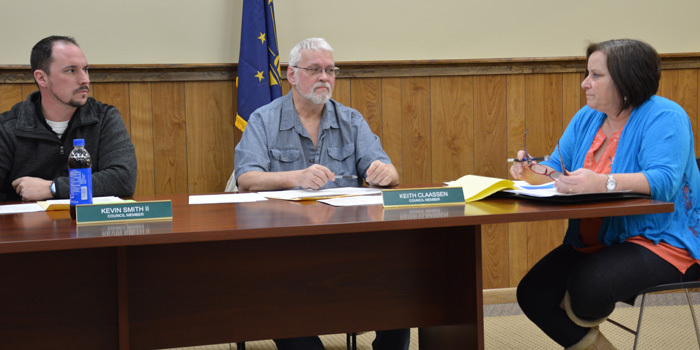 In other business, the council approved two bids for projects from Beer and Slabaugh, Nappanee, in the amounts of $24,800 and $4,800. The two projects involve fixing sewer lines in the town. The town also opened one sealed bid for the teller drawers, safes and safety deposit box units at the town hall. The bid, totaling $1,500, was approved. The council also voted to have the fire department’s water heater fixed as soon as possible. The water heater is currently inoperable. Approved a utility adjustment in the amount of $1,147.80 for the trailer park. Approved the town’s inclusion in the county’s multi-hazard mitigation plan. Thanked the town for supporting the fire department’s March fish fry. The council’s next meeting will be at 7 p.m. Tuesday, April 9.